Thorlabs' 6-axis NanoMax™ Nanopositioning Flexure Stages are ideal for use in fiber launch systems or applications that require sub-micron resolution. Each unit provides 4 mm (0.16") of X, Y, and Z travel and 6° (105 mrad) of θx, θy, and θz travel with a maximum load capacity of 1 kg (2.2 lbs). Versions are available with or without preconfigured piezo actuators and differential or stepper motor actuators. The nominal deck height of the stage is 112.5 mm (4.43"), which matches that of our 112.5 mm tall 5-axis stage kits. Adapter plates are available for increasing the 62.5 mm deck height of our 3-axis and 4-axis flexure stages to 112.5 mm, enabling compatibility with our 6-axis stages. The parallel flexure design ensures precise, smooth, continuous motions with negligible friction. For complex, multi-axis positioning, parallel flexure stages that incorporate three or more degrees of freedom into a single compact unit provide significantly improved performance over serialized stacks of translation stages. See the Design Features tab for more information. 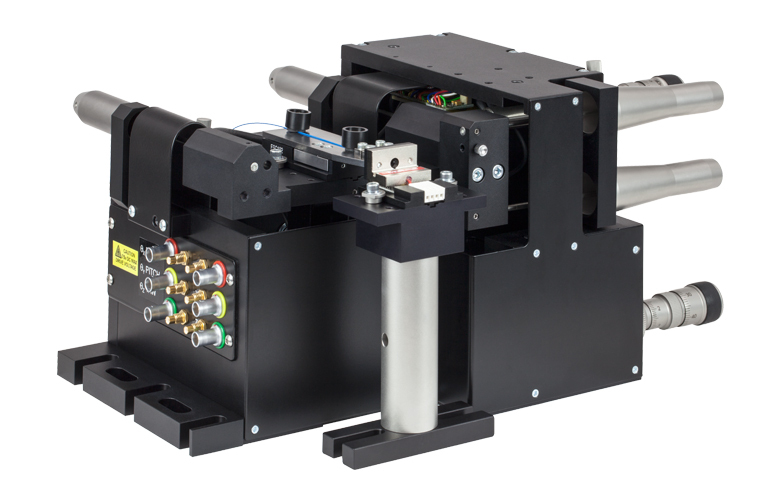 A powerful tool for nanopositioning, our 6-axis NanoMax stages offer two innovative features: a common point of rotation and a patented design that allows all actuators to be coupled directly to the base to minimize any unwanted motion in the system. The tip of a removable stainless steel probe marks the stage's common pivot point for all rotational axes. Each 6-Axis NanoMax stage has a stainless steel probe in front of the moving platform, as shown in the photo to the left, indicating the common pivot point for all rotational axes. Having a common pivot point for all rotational axes reduces alignment time of a system by eliminating need for compensating lateral movement when adjusting θx, θy, and θz. If the moving platform is translated from its position, the pivot point also moves relative to the base, retaining its position relative to the moving platform. The nominal position of this point is in the mechanical drawing, which can be found by clicking on the blue info icon ( ) in the table to the right. See the Design Features Tab for more information. Stages that are pre-configured with differential micrometer actuators or stepper motor actuators are offered below for out-of-the-box operation. The modular design of our 6-axis NanoMax stages allows the drives to be removed and replaced at any time. For compatible drive options, please see the Drives tab. The drives are coupled directly to the base to minimize any unwanted motion in the system. 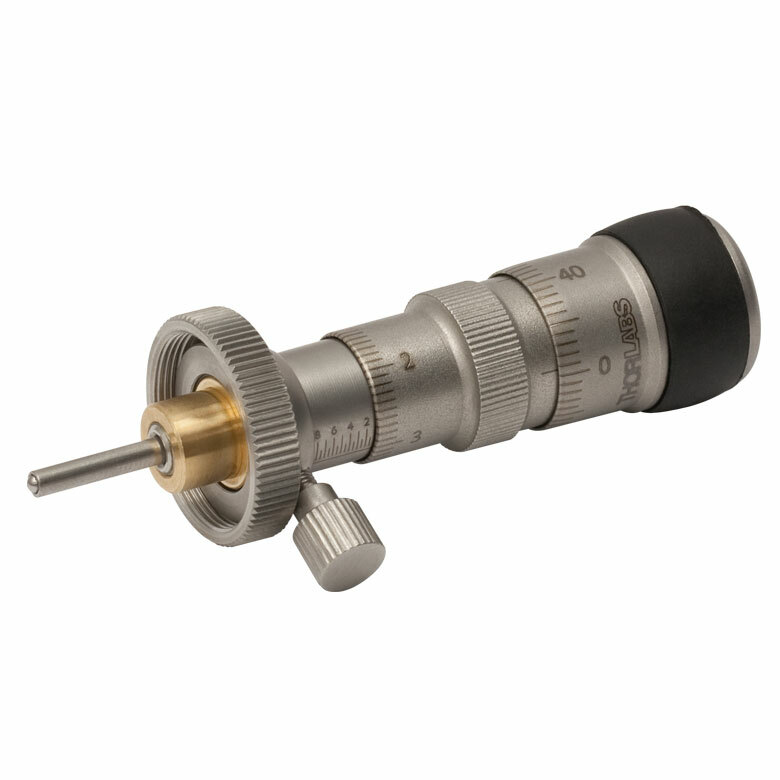 This feature is ideal for any application requiring sub-micron resolution. For nanopositioning applications, we have versions with internal piezoelectric actuators. The option for open- or closed-loop piezos allows these stages to achieve nanometer resolution. The piezoelectric actuators are built into the stage, have 30 µm of travel, and can be controlled using many of our open- or closed-loop piezo controllers (see the Specs tab for all compatible controllers). When these stages are coupled with a NanoTrak controller (e.g. 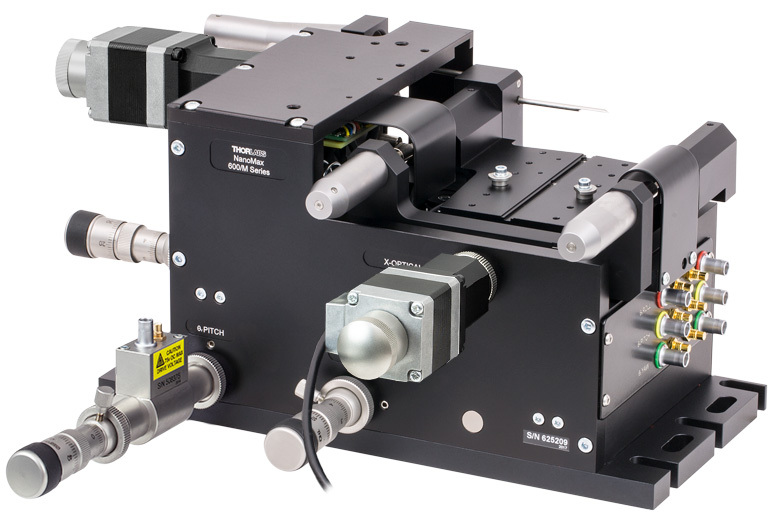 K-Cubes, benchtop, or rack system module), the system becomes a powerful auto-alignment solution that maintains optical throughput and eliminates coupling efficiency loss due to thermal drift or other external forces. These piezo stages include six PAA100 Drive Cables and, in the case of closed-loop systems, six PAA622 Feedback Converter Cables. Stages with open-loop piezo actuators do not have a strain gauge displacement sensor and are ideal for applications requiring positioning resolution down to 20 nm. Versions with closed-loop piezo actuators have internal strain gauge displacement sensors that provide a feedback voltage signal that is linearly proportional to the displacement of the piezoelectric element. This feedback signal increases the resolution to 5 nm and can be used to compensate for the hysteresis, creep, and thermal drift that is inherent in all piezoelectric elements, making these stages an excellent choice for applications requiring nanometer resolution. Please note that the piezo mechanism uses contact with the micrometer drives in order to move the top platform. If for any reason the stage is operated with the micrometer drives removed, blanking plugs must be fitted before the piezo actuators can function. To order blanking plugs, please contact Tech Support. A wide range of accessories, shown below, is available to mount items such as microscope objectives, collimation packages, wave guides, fiber, and much more. These accessories can be easily aligned on the top platform of the 6-axis stage using a central keyway. This keyway in the top platform allows for rapid system reconfiguration while maintaining accessory alignment throughout the experiment. These items are not compatible with 4-Axis MicroBlock stages or 6-Axis NanoMax stages. PAA613 3 m Extension Cables are also included. Please note that for the X- and Y-axes, 1 mm of micrometer travel will translate to 1.5 mm of stage travel due to the 1:1.5 gearing ratio. Other axes have a 1:1 ratio. Step 1: Rotate the actuator counterclockwise to disengage the actuator from the platform. 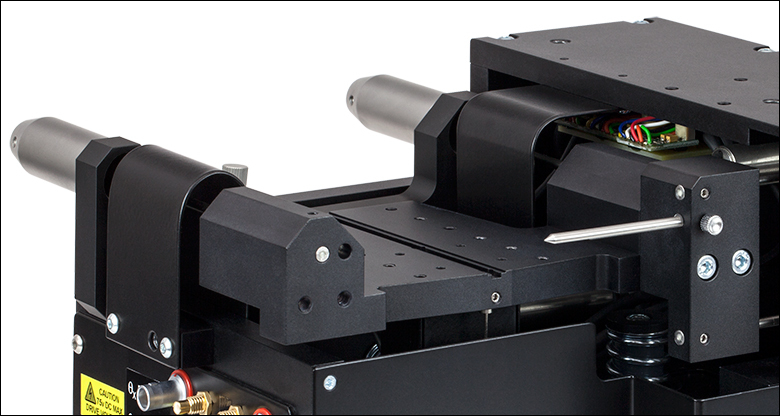 All 6-Axis NanoMax systems have a modular design that allows the drives to be removed and replaced at any time. This allows for mix-and-match customization of actuators depending on the amount of automation or resolution needed on each axis. Replacing a drive is simple and can be done in three steps. First, retract the leadscrew of the actuator until it is no longer engaging the moving body of the stage. Then unscrew the knurled knob attaching the existing drive to the stage. Finally, attach the new drive to the stage using the same knurled knob. The drives compatible with our 6-axis NanoMax stages are summarized below. While some drives have longer travel ranges, in all cases the NanoMax 6-axis stages have a travel range of 4 mm in X, Y, and Z and 6° of roll, pitch, and yaw. For more detailed information on each drive, please see the full presentation for our Stepper Motor Drive, Differential Micrometers and Thumbscrew Drives, or In-line Piezo Actuators. For complex, multi-axis positioning, parallel flexure platforms, see Figure 1, that incorporate three or more degrees of freedom into a single compact unit provide significantly improved performance over serialized stacks of translation stages. Thorlabs’ patented parallel flexure technology lies at the heart of the NanoMax™ family of nanopositioning platforms. The starting point for the conceptual design is the observation that the motion of a rigid body has six unique degrees of freedom. Each actuator should subtract one degree of freedom from the body, so that the body is fully constrained with six actuators. 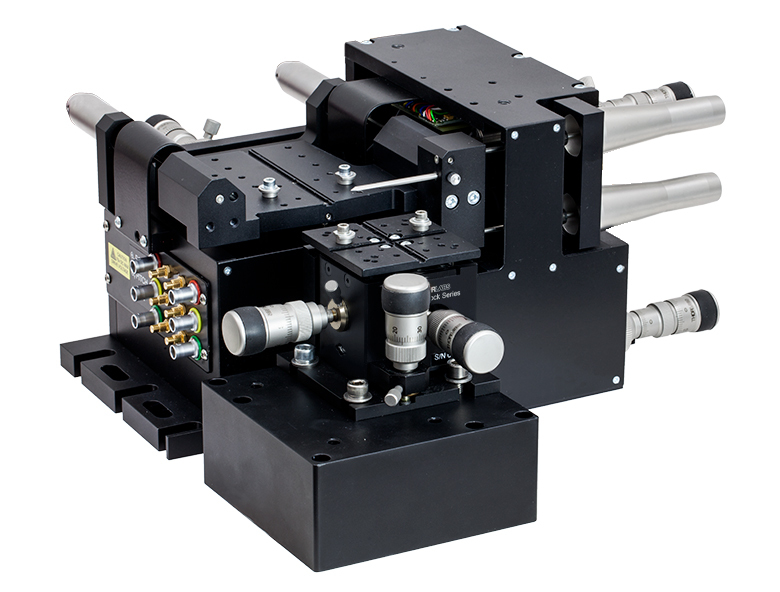 The parallel flexure design of the moving platform provides an unmatched combination of high stability and resolution in a six-axis nanopositioner. The mechanical stiffness is an order of magnitude higher than traditional serial flexure designs. In addition to those already mentioned, there are several other intrinsic advantages of the parallel flexure design: a much lower working height compared to stacked axis stages, additional resistance to external forces, and significant improvements to damping capabilities. Also, since there are fewer moving parts, there is a reduction in the inertia of the moving platform. This leads to excellent dynamic performance, making this product ideal for fast automated alignments. This design also solves the problem of error buildup commonly seen in stacked (serial) designs as discussed below. It is important to note that parallel flexures, like serial flexures, exhibit crosstalk or arcuate motion. As a stage is moved to either side of its central position, transverse arcuate displacements of approximately 20 μm per millimeter of travel occur. If several axes are moved at once, the combined effect can be greater; however, unlike the random positioning errors found in traditional stages, this crosstalk is highly predictable and hence can be corrected via small adjustments. Although these arcuate displacements are sometimes a concern, they rarely hinder the alignment of fibers or other optical components since optical beams rarely propagate collinearly with the axes of any stage to better than the scale of the arcuate motion. Furthermore, when using a NanoTrak™ Auto-Alignment Controller, these effects are automatically compensated for by the controller itself. However, if arcuate motion is a limiting parameter of a particular alignment or positioning application, its effects can also be compensated for with software. Multi-axis systems are traditionally built by stacking together a series of single axis mechanisms, as shown in Figure 2. As the number of axes increases, the design grows in complexity and becomes cumbersome. In addition, stacking drives reduces stiffness and can introduce a host of positioning errors. All traditional designs of multi-axis stages (e.g., roller bearings, ball bearings, or flexures) suffer from the buildup of errors as stages are stacked. For a simple stacking of two stages, two main errors must be considered: cosine and Abbe. The cosine error arises when the axes of two stages are not aligned orthogonally to each other. The Abbe error arises from the finite height of the upper stage. Any angular roll, pitch, or yaw errors in the lower stage will be amplified by the overall height of the stacked system. The situation is particularly pronounced for a six-axis stage, where the mechanism providing the sixth degree of freedom is stacked atop five other stages. All of the errors in the preceding stages combine to make the overall volumetric accuracy of the complete stack far worse than the errors associated with any individual stage. A parallel platform design solves the problem of error buildup. The design intent was to conceive the flexure as a rigid rod that has a flexible coupling at each end, leading to exactly two rotational degrees of freedom. This rod structure constrains the motion of the top plate by connecting it to the base. Six such rods provide the six independent constraints needed to restrain the stage, neither over- nor under-constraining it. To actuate movement in the top plate, the ends of the flexure rods not attached to the top plate are connected to linear actuators. Linear translation occurs by moving the appropriate pairs of flexure rods in the same direction, whereas rotation occurs by moving the appropriate pairs of rods in opposite directions. To transmit motion accurately, it has been shown that it is preferable to have as few moving parts acting in series as possible. At each interface between parts, microscopic imperfections can exist which will create friction between the parts. Such friction tends to be unpredictable and uncontrollable, making it the most undesirable element of any high-performance design. Parallel flexure platforms have very few moving parts and can transmit motion very precisely. Tests performed over 30 μm in 1 μm steps have yielded a root-mean-square bidirectional repeatability of 30 nm, or 0.1% of full range for the 6-axis NanoMax stages. These results are made possible by the inherently superior performance of the parallel flexure mechanism that eliminates static and kinematic friction within the platform. During operation, 6-axis NanoMax platforms do not suffer appreciably from wear and tear due to the minimal number of moving parts. Since there are no bearings in the moving parts, there is no degradation of positioning performance with time. This also reduces the maintenance costs since the only parts that may require servicing are the drive actuators. Moreover, setups do not need to be completely disturbed for stage maintenance. Drives can be very easily and quickly swapped, minimizing system down time and inconvenience. However, when the actuator is removed the platform will move from its position. Figure 3: The tip of a removable stainless steel probe marks the stage's common pivot point for all rotational axes. Click here to see the mechanical drawing indicating the common pivot point. A unique mechanical feature of the 6-Axis NanoMax stages is the addition of a single common pivot point, shown in Figure 3, for all three of the rotation axes (θx, θy, θz) to simplify any alignment challenge. In practical terms, this means that the need to compensate lateral movement is nearly eliminated when making rotational adjustments to any axis. For complex alignments of planar optical devices this can vastly reduce the time required for optimizing a system. 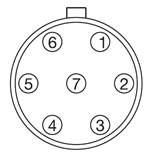 Usually a fiber holder is attached so that the tip of the fiber is held at the common rotation point with all of the attached adjusters at the middle of their translation range. For instructions on positioning the top plate please see page 13 of the manual. If the moving platform is translated from its midpoint, the pivot point also moves relative to the base, retaining its position relative to the moving platform. Once the mounted accessories are aligned on the platform, the stainless steel probe can be removed by loosening the knob on the front of the unit, as shown in Figure 4. Figure 5: 6-axis stage configured with various actuators. Please see the Drives tab for all options. All actuators are connected directly to the base of the system rather than the moving top plate, thus minimizing unwanted motion within the system. Consequently, during manual operation, this allows operators to achieve a higher resolution with less skill. In motorized and automated applications, actuator vibration and shocks have little effect on the moving top plate. The modular design of our 6-axis NanoMax stages allows the drives to be removed and replaced at any time. This allows for mix-and-match customization of actuators depending on the amount of automation or resolution needed on each axis. 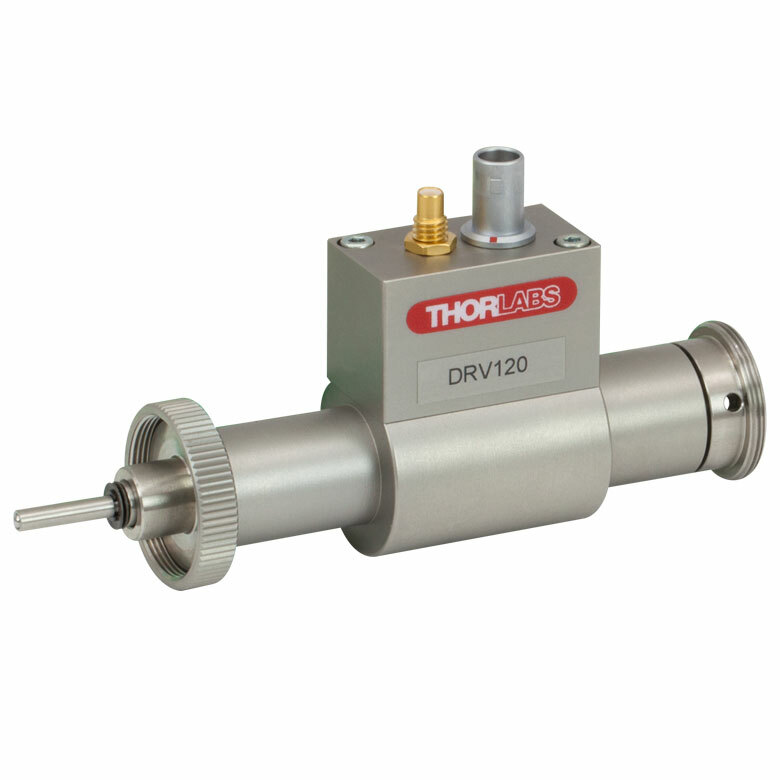 Thorlabs offers a number of drive options including fine-thread thumbscrews, differential micrometers, motorized actuators, and piezo extenders. Figure 5 shows various drive options attached to different axes. This modularity allows the stage to be highly versatile for all applications. Versions are also available that have internal piezoelectric actuators giving 30 μm of travel with resolutions down to 1.0 nm, either open-loop or with strain gauge position feedback (closed loop). For increased performance and stability, the drive voltages are also controlled by built-in circuitry to compensate for thermal variations. For all of our compatible drive options, please see the Drives tab. Pre-configured stages are also offered that have differential micrometers or stepper motor actuators for out-of-the-box manual or motorized operation, respectively. Thorlabs' 6-axis stages have a low platform height of 112.5 mm (4.43") for increased stability. This height also makes the 6-axis stage compatible with our 112.5 mm tall 5-axis stage kits. As shown in Figures 6 and 7, adapter plates are available for increasing the 62.5 mm deck height of our 3-axis and 4-axis flexure stages to 112.5 mm, enabling compatibility with our 6-axis stages. A central keyway in the top platform allow for rapid system reconfiguration while maintaining accessory alignment. 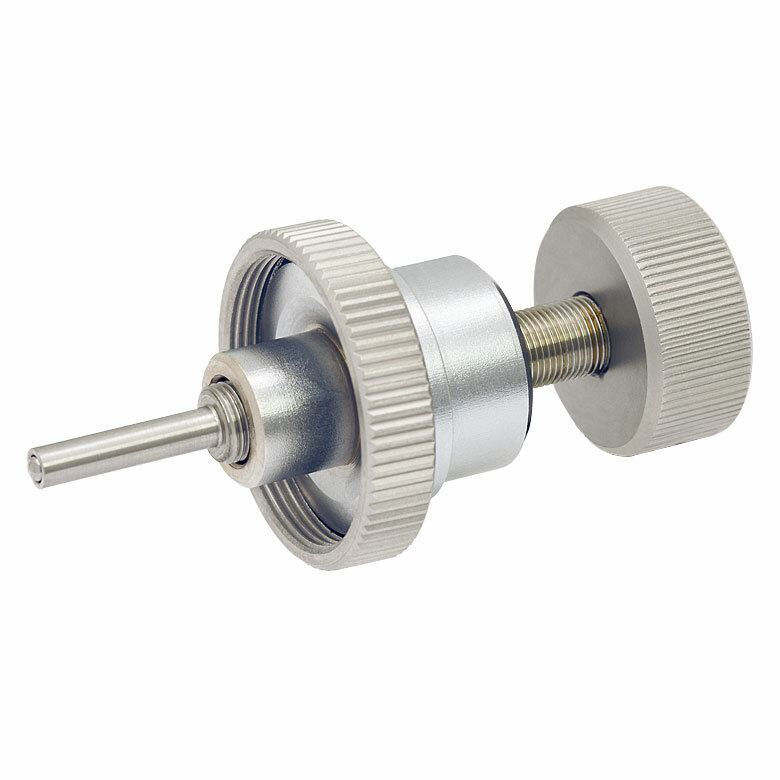 A wide range of accessories is available to mount items such as microscope objectives, collimation packages, wave guides, fiber, and much more. Dear Sir: I come from Chroma ATE Inc. I have some question for this apt™ Stepper Motor Controllers Type:BSC203 with Motor Type :DRV001(see on the motor's connecter) and Stage Type :MAX604 - 6-Axis NanoMax Stage, Stepper Motors, No Piezos, Right-Handed(see on the stage's box) 1.I'd like to know device unit about the motor: (nm/Pulse?) According to ThorLab official specification value: a.Minimum Incremental Movement:60nm/pulse.Does device unit? b.Lead Screw Pitch:0.5mm.Does express motor rotation one circle forward 0.5mm? c.Microsteps per Revolution of Leadscrew:Does express motor rotation one circle need 409600pulse? So (Lead Screw Pitch/Microsteps per Revolution of Leadscrew)=Minimum Incremental Movement,but 1.2nm is not equal 60nm ，why? 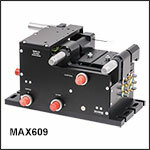 2.Kinesis software(Actuator set APT600L X Axis) a.Step Size=0.5mm: motor rotation one circle forward 0.5mm? but autaul half circle I see. b.Travel:8mm ,but I could move 12 mm (show on the current device postion). Does I configuration error? 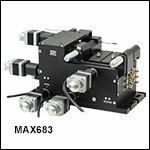 3.We use MAX604/M stage,I'd like to know (Roll,Pitch,Yaw) device unit. I have seen MAX604/M Manual, but I'm not sure. page:21 path:https://www.thorlabs.com/drawings/11c303460db0cce4-17B504EE-5056-010E-86CD5C9A5BF9295C/MAX604_M-Manual.pdf Thank you. Response from Ben at Thorlabs: Thank you for your feedback. I believe this relates to the conversion between microsteps to real world units. For the DRV001 connected to the BSC203, 1mm equates to 819200µs. I will be in direct contact with you so I can gather more details on your system, and troubleshoot you Kinesis issue in more detail. Dear Sir, Don'y you provide a Left-Handed version from this stage: 6-Axis NanoMax Stage, Differential Drives, Closed-Loop Piezos, Right-Handed, Metric? 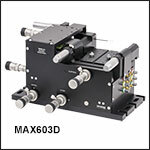 Response from Chris at Thorlabs: Yes, we can provide a left handed version of MAX603D/M at the same price. We will contact you directly via email with a quote. Are the definitions of the rotational angles such that every successive rotation happens about the rotated coordinate system (intrinsic rotation) or the original one (extrinsic rotation)? Thanks! Is de RMS repeatability given in closed loop mode? Response from Mike at Thorlabs: Yes the RMS repeatability was measured in closed loop mode. Response from Jeremy at Thorlabs: I will get in contact with you directly to look at your VI and resolve this issue. I have a Nanomax 6-axis stage with DRV001 steppers. I need to have the z-axis translation very short beyond home position of 0.000 mm because my inverted microscope objective has a 0.35 mm working distance and it will strike the bottom of my window if it goes higher than that. The problem is that when I home my motors (using Labview 2011 ActiveX), the motor positions the platform about 2 mm above the location where the DRV001 first re-engages the stage when it homes and then the position gets initialized at that position to be 0.0000. I cannot translate to negative values, 0.000 is the minimum. This leaves my objective too far under the window (by about 1.65 mm). If I adjust the height of the objective upward to best focus, then do a subsequent home command, it lowers the platform (and window) and it crashes into my objective. I noticed the pitch on the z-axis loads as 0.5 mm, but if I change manually to 0.75 mm in APT User, then the z-axis home positioning seems to work correctly. But I have to do that manually. How can I change the settings so that the correct parameters load when launching my labview VI. A response from Adam at Thorlabs: Yes, the Max600 series can provide tip and tilt adjustments to help limit the defocusing of the substrate. However, the defocusing element also depends on the substrate being used and the sample size that you are imaging. Also, there may be a better stage system that we can provide which may be more compatible with your microscope. One system that you may want to consider is a MAX300 series stage with a APY002. I will email you directly to get more information about your setup. I would like to use the stage to adjust a substrate parallel to an objective of a microscope (remove tilt) and then translating it X and Y without defocussing the substrate. Is this possible? Response from Laurie at Thorlabs to amirhossein: Thank you for your interest in our 6-axis stages. Someone from our technical support staff will contact you and work with your directly to determine the best stage for your application. What is the tolerance on each axis with respect to the common pivor point? In the above application, a 3-Axis NanoMax flexure stage is aligned in front of a 6-axis stage at the proper 112.5 mm deck height using an AMA554 Height Adapter. Thorlabs offers three different 3-Axis Stage variations: NanoMax flexure stages, MicroBlock compact flexure stages, and RollerBlock long-travel stages. Each stage features a 62.5 mm nominal deck height. Our NanoMax line of 3-axis stages offers built-in closed- and open-loop piezos as well as modular drive options that include stepper motors, differential drives, or additional piezos. The MicroBlock stages are available with differential micrometer drives or fine thread thumbscrews; these drives are not removable. Finally, our RollerBlock stage drivers can be switched out for any actuator that has a Ø3/8" (9.5 mm) mounting barrel. 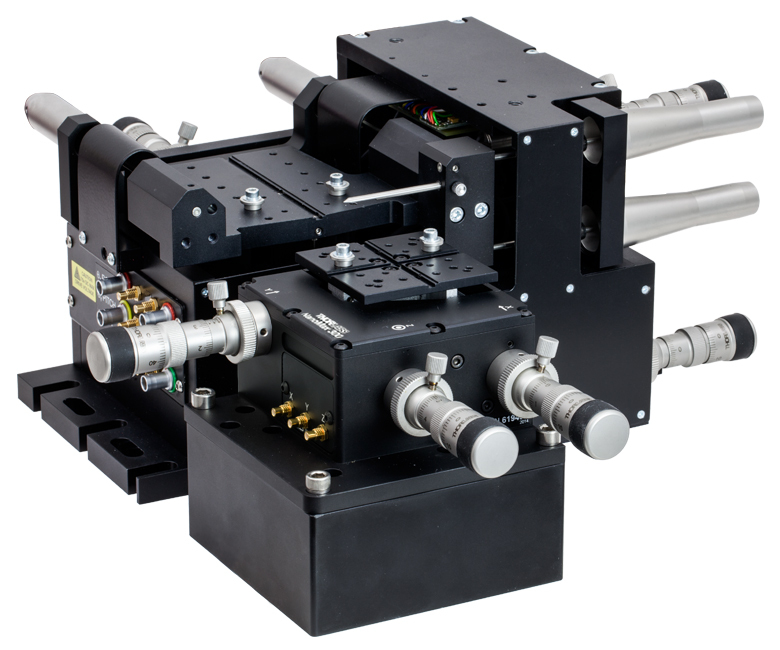 Our 4- and 5-axis stages are ideal for the static positioning of waveguides or complex optical elements with respect to our 3-axis or 6-axis high-performance alignment stages. Thorlabs' 5-axis stages have nominal heights of 62.5 mm or 112.5 mm. The AMA554 Height Adapter can be used to raise the deck height of the 3-axis or 4-axis stages to 112.5 mm for compatibility with our 5-axis MicroBlock or 6-Axis NanoMax Stages. Thorlabs' 6-Axis NanoMax Nanopositioners are ideal for complex, multi-axis positioning and have a nominal deck height of 112.5 mm. These stages offer a common point of rotation and a patented parallel flexure design that allows all actuators to be coupled directly to the base to minimize any unwanted motion in the system. Built-in closed- and open-loop piezo options are available. A selection of modular drive options allows any axis to be manual or motorized with the option for external piezos. Our units without included actuators are also available in right- or left-handed configurations. To increase the stage height of the 3-axis stages to 112.5 mm, we recommend our AMA554 Height Adapter, shown in the image to the right. A complete selection and comparison of our multi-axis stages is available below. Nominal deck height of 62.5 mm and optical axis height of 75 mm can only be achieved using the PY005A2 Height Adapter and MMP1 Mounting Plate. Full coarse travel range of the DRV3 Differential Actuator is 8 mm (0.31"). This range is limited to 4 mm (0.16") or 6° (105 mrad) by the stage. Please note that for the X- and Y-axis, 1 mm of micrometer travel will translate to 1.5 mm of stage travel due to the 1:1.5 gearing ratio. Other axes have a 1:1 ratio. Thorlabs' 6-Axis NanoMax stages with Differential Adjusters provide 4 mm (0.16") of coarse X, Y, and Z travel with 300 µm of fine travel. They also provide 6° (105 mrad) of θx, θy, and θz (Roll, Pitch, and Yaw) Travel with 18 arcmin (5.2 mrad) of fine travel. The coarse adjuster has a Vernier scale with 10 µm graduations for a resolution of 5 µm. The fine adjuster has a Vernier scale with 1 µm graduations allowing for a resolution of 0.5 µm. 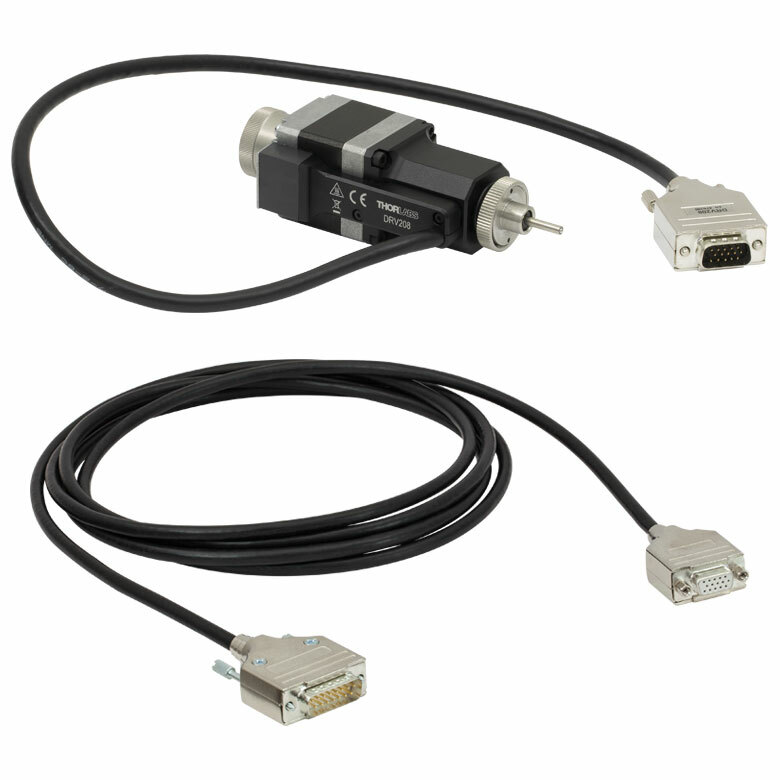 This resolution and travel range make these stages ideal for optimizing the coupling efficiency in a fiber alignment or waveguide positioning system. The graduations also allow for a clear reference point for absolute positioning within a system. Please note that for the X- and Y-axis 1 mm of micrometer travel will translate to 1.5 mm of stage travel. Please see page 10 of the manual for more information. The modular design of the included drives allows them to be replaced at any time; please see the Drives tab for more details and our full selection of compatible actuators. In addition to the features above, the MAX602D(/M) and MAX603D(/M) NanoMax Stages incorporate open- and closed-loop piezoelectric actuators, respectively, with 30 µm of travel. The open-loop design does not contain an internal strain gauge sensor. The theoretical resolution of the piezo actuators is 1.0 nm for the X-, Y-, and Z-axis and 0.018 µrad for the θx, θy, and θz rotational axes. This feedback loop created when using our closed loop system is ideal for compensating for the hysteresis, creep, and thermal drift that is inherent to all piezoelectric elements. These piezo stages include six PAA100 Drive Cables and, in the case of closed-loop systems, six PAA622 Feedback Converter Cables. Full travel range of the DRV208 Stepper Motors is 8 mm (0.31"). This range is limited to 4 mm (0.16") or 6° (105 mrad) by the stage. Thorlabs' 6-Axis NanoMax Stages with stepper motor actuators provide 4 mm (0.16") of X, Y, and Z travel and 6° (105 mrad) of θx, θy, θz (Roll, Pitch, and Yaw) travel. The actuators can achieve a bidirectional repeatability of 5.0 µm. Hall effect limit switches provide a high repeatability ideal for homing the motors. This is critical for auto alignment applications that rely on a highly repeatable zero point. The high repeatability and small step size make these stages ideal for any high-precision automated fiber launch system or general application. The modular design of the included drives allows them to be replaced at any time; please see the Drives tab for more details and our full selection of compatible actuators. Each stage also includes six PAA613 3 m extension cables for the stepper motor actuators. In addition to the features above, the MAX682(/M) and MAX683(/M) NanoMax Stages incorporate open- and closed-loop piezoelectric actuators, respectively, with 30 µm of travel. The open-loop design does not contain an internal strain gauge sensor. The theoretical resolution of the piezo actuators is 1.0 nm for the X-, Y-, and Z-axis and 0.018 µrad for the θx, θy, and θz rotational axes. This feedback loop created when using our closed loop system is ideal for compensating for the hysteresis, creep, and thermal drift that is inherent to all piezoelectric elements. These piezo stages also include six PAA100 Drive Cables and, in the case of closed-loop systems, six PAA622 Feedback Converter Cables. Please see the Specs tab for complete specifications. See the Drives tab for all compatible drive options. 6-Axis Stage configured with various actuators. Please see the Drives tab for all options. Thorlabs' 6-axis NanoMax stages, which are designed for those who wish to customize the installed actuators, are able to provide 4 mm (0.16") of X, Y, and Z travel and 6° (105 mrad) of θx, θy, θz (Roll, Pitch, and Yaw) travel when drives are installed. This allows each axis to be configured depending on the precision or automation needed. 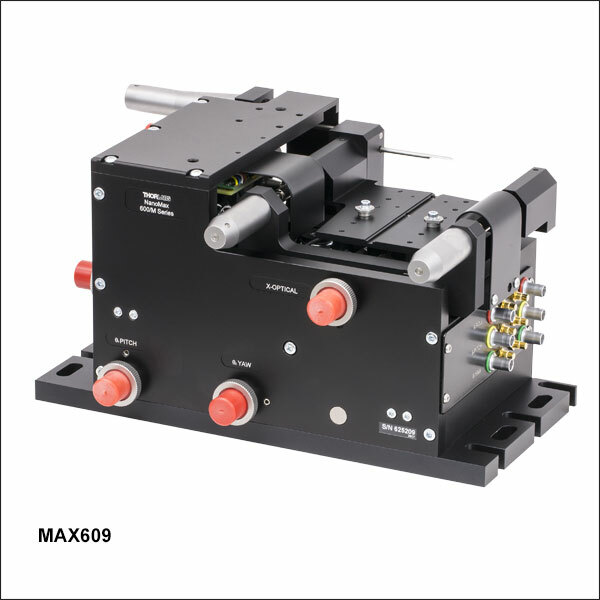 Whether the application is a multimode fiber launch system using thumbscrews or an automated alignment setup using stepper motor actuators, each axis can be configured to meet the demand. For a list of all compatible actuators, please see the Drives tab. In addition to the features above, item numbers starting with MAX608 or MAX609 incorporate open- and closed-loop piezoelectric actuators, respectively, with 30 µm of travel. The open-loop design does not contain an internal strain gauge sensor. The theoretical resolution of the piezo actuators is 1.0 nm for the X-, Y-, and Z-axis and 0.018 µrad for the θx, θy, and θz rotational axes. This feedback loop created when using our closed loop system is ideal for compensating for the hysteresis, creep, and thermal drift that is inherent to all piezoelectric elements. These piezo stages include six PAA100 Drive Cables and, in the case of closed-loop systems, six PAA622 Feedback Converter Cables.